My Granddaughter made this little Potato Head*vignette* of her PaPaw, Grandmama, and little brother, Sidekick Scott. I thought it was hilarious and had to share it with all of you. Well...Summer 2012 is here! What are your plans? I've already been busy with an early garden bounty, end of school year programs, and the annual week of Vacation Bible School. AMAZING WONDERS is this years Theme! I assume that most of you know about VBS but for those who may not take part in this summer ritual: VBS is like Bible Boot Camp for kids! Most of the time it lasts an entire week. Our church schedules VBS the week after school is out...before family vacations begin taking folks to the beaches and to the mountains. The children hear Bible stories, sing lots of upbeat songs, play games, make awesome crafts and enjoy snack time. I was in charge of the Kitchen Brigade and we served, trailmix, nachos, hot dogs, cookies, and ice cream. Boil your squash and onion till fork done. Salt & Pepper to taste. Mix eggs, sour cream, soup, and enough milk to make mixture creamy. Fold in your cheese (reserve some for your topping) and pour into buttered or greased casserole dish. The amount of squash you use will determine the size casserole dish. Now melt butter and pour over crushed crackers till crumbly. Sprinkle over casserole along with reserved shredded cheese. Bake at 350 till set, approx. 30-40 min. I typically serve this dish as a side with a meat entree except for last week when #1 Husband and I ate ONLY squash casserole with a side salad and fresh strawberries for dessert. We didn't miss the meat at all...we eat MUCH less meat when the weather warms. Most of our meat is grilled during the summer months. I have a stitching play-date coming up with a good friend and old teaching colleague who retired with me in Dec. 08!! 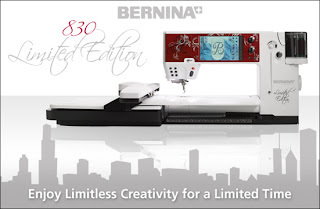 She just bought a brand new Bernina quilting/embroidery 830 machine. She has invited me over for a test drive....oooh, ahhhh, squeal like a little girl................I'm so excited!!! I LOVE you Celina!! for my Aussie and New Zealand friends. I've got several swaps and projects coming due on a fast approaching timeline. I'll get some pictures up ASAP!! Names for Prayer Request Sunday. Jannette lost her mother so be sure to stop by and read Jannette's note to all of us. Our VBS lasts only one Saturday now, but I remember the "old days" when it was a week. In fact, when my boys were younger I taught in VBS every summer. There are some great memories there. Hi Sweetie I haven't heard from you in a while, some how I missed your Sunday blog. I am sure I didn't get it because I always read them even if day behind. I figured you were busy with school ending,husband retiring etc. I have things to tell you but will send e-mail. We haven't made any plans yet for summer. I remember going to VBS when I was a kid. Take care. Boy Scout camp begins next week so I will be off in the woods with no internet connection. I return the end of the month and take off for the States to make the rounds of kid visits. Our VBS will be in August when I return. (every year I do the games ... now doesn't that stand to reason that the oldest volunteer gets the most wild and active part)? I have a good HS assistant who has been helping me for the last five years. He has a good understanding of when I need a kid and when I need a leader, so we make a great dog and pony show. Good ol' VBS!!!! Great fun for everyone...:) How wonderful that you are able to volunteer your help. The squash recipe looks very yummy. Thanks for sharing your recipe. This last weekend we did a family BBQ, my husband grilled cut-up summer and zuchinni squash. He wrapped them up in foil with...butter, s&p, and a veggie seasoning. OH my! those were a hit! Everyone loved it! Could you please add to your prayer chain a request for our family? My brother, Mark, has pancreatic cancer that has spread to his liver. And, now we also just found out my mom had a breast lump removed, and it did come back cancerous. My sister (from Ohio), and I (I'm in Calif) are traveling there soon (to Utah) to see her. She has a return doctor's appt before we arrive to see what their plan of action is. I would really be grateful for all of the prayers. Thank you so much for praying! Blessings for a beautiful weekend, dear friend! I love the Mr. Potato Heads. My kids would add the Disney character parts ones that we have to make it a party. Have a great time testing out your friend's new baby...just don't sneak it home for yourself. When I was in High School, I was a counselor for two years at my church's Bible Camp. It was fun. I may have gotten more out of it than the children. This summer we will be going to the pool, and having play dates. love the grandkids, your summer salads, your joie de vivre this season....you been busy girl..
That looks so good. I may have to make that recipe this summer. Sadly I have a husband who is VERY picky with veggies no matter what I try. He will not touch squash of any kind (and a whole host of other veggies) but I may see if this has the 'right' stuff added to make him maybe at least tolerate it. Wish me luck. Thank you. I know I'll eat it or make it every time my son and DIL come to visit.